Made from injection molded plastic for affordability. Features slanted back design for a clear view of displayed sign. 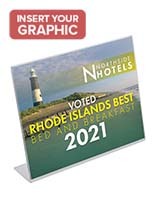 Holds 8.5x11 signage, enabling users to print their own advertisements! Easy, top-loading capabilities for quick graphic changes. This slanted sign holder is crafted from injection molded plastic. 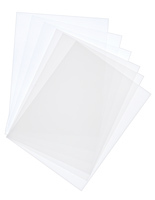 This affordable material enables each desk top frame to be offered at wholesale pricing. 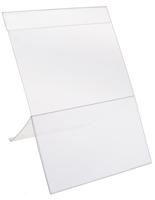 Customers can then purchase this molded plastic, slanted sign holder in bulk, for use in multiple business locations. 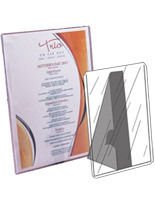 Countertop display frames, like the ones seen here, are often used by a variety of industries, including retail stores, movie theaters, banks and more. This slanted sign holder that angles back can be used by movie theaters to promote limited time offer, like specialty refreshments being offered to coordinate with a new movie release. This angled design enables patrons to easily read the entire advertisement. 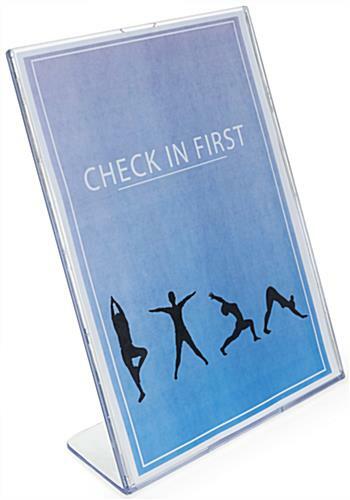 Retail locations often place plastic frames on checkout counters, encouraging customers to open a store credit card or return for a promotional event. 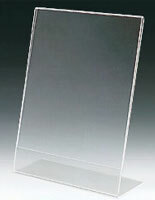 The clear plastic make of each slanted sign holder that is L-shaped will coordinate with any location it is placed in. 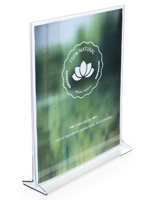 These signage display frames, like similar models crafted from acrylic, feature an easy to use design. Each slanted sign holder that loads from the top enables users to easily remove and change displayed advertisements. Simply use the groove to easily remove your graphics. 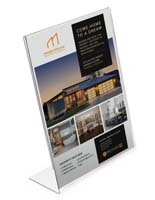 Each slanted sign holder features a thumb notch to make print change outs that much easier. This particular model is designed to hold standard, 8.5 x 11 signage. 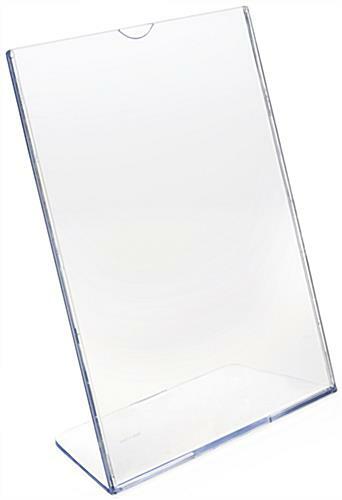 This slanted sign holder size is ideal for users to create their own advertisements on a home printer! 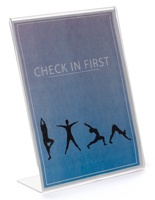 This print frame is intended for shoppers that are on a strict budget, and can't afford the more costly acrylic units. 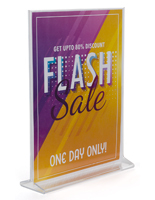 Buy this slanted sign holder in large quantities to receive in larger discounts. 8.6" x 10.6" x 3.5"
Best Sign Holder I have found yet! We use many sign holders throughout the year. We use them at our many different conferences all across the country. Many times they arrive with some breakage. Have 12 - 2 get broken. However, since using this style and model of sign holder we have not had any breakage. They are sturdier and hold up well. I am glad I found these. We're glad you found them too, Robert! Thank you for taking the time to leave such a nice review. We wish you smooth, successful and easy conferences in the future and we're here if you need anything else for your events! Thank you for the honest and thorough feedback, Aidan! We're always looking for ways to improve so we appreciate your input! Thanks so much for shopping with us and taking the time to review. We hope you shop with us again soon! Great price point, sturdy acrylic material, shipped well! Used for multiple trade shows (indoor and out) and not one single crack!!! Thanks!! We LOVE this review and the photo! Thanks for sharing both. We're so glad these sign holders worked so well for you! We hope we can work together again soon. These are nice acrylic frames. I looked at a few sites, and found these to be the most reasonably priced option. This is so cool, Erin! Thanks for sharing this with us!